Saline lands in Western Australia (WA) often suffer winter waterlogging, with the levels of salinity and depth to watertable varying markedly both spatially and between seasons. These areas have traditionally had poor pasture production, but productivity can be markedly increased through use of adapted salt tolerant legumes and grasses, particularly when used in mixtures. The recent release of Neptune messina means that salt tolerant legumes are now available for all but extremely saline land. Approximately one million hectares in the south-west agricultural region are severely affected by salinity. A further 1.8–2.7 million hectares have been identified as being at risk from shallow watertables and/or soil salinity. Depending on future climate and watertable trends, cropping could become risky in these areas. Saltland soils are often associated with waterlogging in winter, due to the presence of a shallow watertable. Waterlogging causes soils to become oxygen deficient, resulting in increased salt uptake and decreased potassium uptake by plants. The combination of both stresses makes saltland soils particularly difficult for plant growth. Salinity and waterlogging can be highly variable over short distances. Most traditional pasture legumes are sensitive to salinity, and as a result saline soils are often nitrogen deficient. Subterranean clover is particularly sensitive to salinity and is one of the first species to disappear from pastures when land becomes salt-affected. 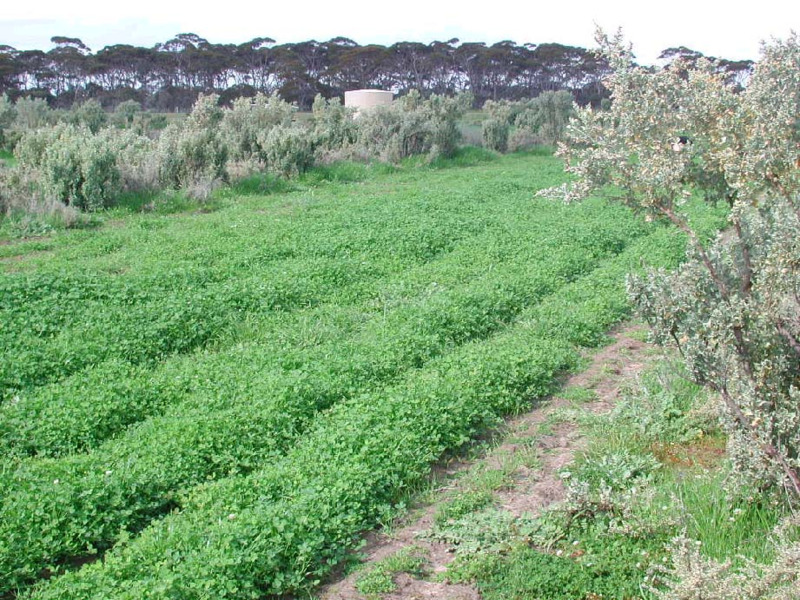 The growth of salt and waterlogging-tolerant legumes and grasses can complement saltbush-based pastures when used as an understorey. Research has shown this can increase pasture profitability up to $60 per hectare, depending on the severity of the site, input costs, livestock prices and pasture management. Surface (0–10 centimetre) salinities vary throughout the season (see Figure 1). They are generally highest over the summer-early autumn period, prior to the break of season, and lowest in mid-winter. Rainfall flushes salt from the surface down the soil profile, while evaporation in spring and summer causes salt to rise again to the surface. Below a depth of about 25 centimetre (cm), soil salinity tends to stay more constant. Annual plants on saline soils have a shorter growing season than those on adjacent non-saline soils. High salinities at the start of the growing season delay germination and can kill germinating seedlings of susceptible species. Plants adapted to saltland must, therefore, either have a high tolerance to salinity during germination or ways to defer germination until later, when surface soil salinities are lower. In spring, high salinities kill plants prematurely and reduce the time available for seed set. To survive on saltland, perennial plants need to cope with the additional stress of summer drought. Even under non-saline conditions, few perennial pasture species can cope with the long summer drought in low and medium rainfall zones. However, on saltland, perennial plants must also either have mechanisms to cope with high salinity or have some form of salinity avoidance mechanism, such as summer dormancy (e.g. puccinellia). In general plants use the freshest water available to them. Perennials, with their deeper root systems, can extract water from more of the soil profile than annuals. Tall wheatgrass, for example, avoids high surface salinity in summer by accessing less saline water from depth and then uses relatively fresh water closer to the surface during winter. On the other hand, saltbushes have shallow roots that extend many metres which seek less saline water.